The first time I enjoyed the tranquility of northern Maine was in the summer of 1954, in the womb. My mother, unexpected to her at the age of forty-four, was to bear a child in January. That child was me. That summer, my pregnant mother did what she always did, as soon as school got out she would trek herself and her children, which at this stage was my brother, seven years older, and my sister, twelve years older, off to Aroostook County. In the tiny town of Island Falls, just over the border of Penobscot County, there were two pristine majestic lakes. One was the spring fed lake where the town well-to-doers spent their summer by and in the clear cold waters. The other, Mattawamkeag Lake, was river fed and thus had yellow tannins in the otherwise clean water, making the tea color that fascinated us when we bathed or swam in the soft waves of the lake that lapped at the shore of our cabin. The cabin was built by relatives after World War 2 because my father promised my mother a cabin on the lake, which my father explained by saying, “you say the darndest things on a 1941 honeymoon”. The cabin would become the place my mother escaped to for two and half months every summer, leaving my father behind in Connecticut to earn a living for his family. He would take his two weeks vacation to join his family, the only choice was northern Maine. As a child, I delighted in the nature and outdoor play of our secluded cabin, accessible only by small fishing boat, located on the far end of the seven mile long lake. As an adult, I ventured to faraway lands, living in my early 20’s in California, then venturing to Europe for three years in my late 20’s. At age 30, I landed back in the metropolis jungle of Manhattan, pursuing various things there. When the summer heat of New York City oppressingly attacked the senses, emanating from the sidewalks and buildings like a hot furnace, I would yearn for the week or ten days I could afford to take with my parents at the cabin. The same allure of calm and nature swept over my body, mind and spirit. In 1997, I began escaping to northern Maine for more time, having purchased the home of my great grandfather William Sewall, nature guide to Theodore Roosevelt, which resulted in an unlikely friendship between two men from different worlds. William’s parents had settled the town in 1845 with one other family, the Craig’s, so it was here that I would make an attempt to follow his legacy of hospitality and healing in the woods of northern Maine. Having taught kundalini yoga for twelve years in the city, I opened a yoga retreat, having no idea what I was doing or what was in store. One thing I had to do was find out more about the area so that I could offer it to the guests whom I hoped would find us. In 1999 Sewall House had its’ first website. People came. Local people, curious about what I was doing, attended classes. They became resources for Baxter State Park and other amazingly, beautiful nature possibilities that I simply had not known in my childhood since my mother was so content at her cabin and in the woods by Mattawamkeag Lake. Since 1997, I have learned about some of the additional possibilities for experiencing the astonishing natural beauty of northern Maine. Here are just a few of the gems you might find if you took the time to drive up 95, which I’m sure are just a sampling. Often people from southern Maine say they had no idea there was anything north of Bangor; that is just the point! Lonely Planet chose this area, a few years back, as one of their top ten choices to visit for wilderness and nature outings in the United States. 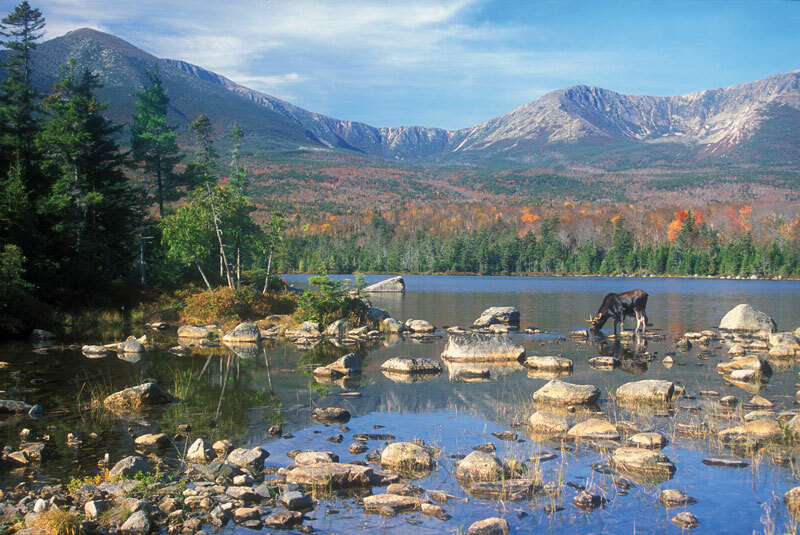 Baxter State Park is best known for Mount Katahdin, the spellboundingly beautiful mountain that soars into the sky as you drive up 95 and stop at the scenic overlook twenty minutes south of the Sewall House exit. The beauty of the great one, as the Native Americans called it, always touches a deep place in my heart. I have climbed Katahdin 3 and a half times, the first time in 1999 when I did the narrow and well traveled precarious Knife’s Edge. My knees at age 62 prefer lesser hikes now and it makes me a little sad as the views from the top are beyond words. Even when we only made it half way up a couple years ago, the good part of the decision not to fully climb Katahdin was to explore the myriad of other hikes in the Park, which Senator Baxter so selflessly purchased and preserved for the people of Maine. Katahdin is in the south end of Baxter State Park. Sewall House is near Patten, the north entrance. One of my favorite hikes there is the Howe Brook Trail, which starts with the option to canoe across a tiny portion of a lake, then hike along a brook until you end up at a tall thin waterfall. There are many others I have yet to explore. At the top, you can luxuriate in the cold water of the falls or have your lunch on the boulders that the stream pours over and around. On the way into Baxter, closer to Sewall House, is Shin Brook Falls, a strong falls that runs harder in the Spring and early summer, becoming gentler as the summer moves on, allowing for climbing up the rocky ledges or massaging the shoulder sitting under the tumbling waters of the falls. There are many paths in, some steeper than others, on this short hike. The longer way comes along the gurgling stream. With backtracking from there you arrive looking down at the falls, then walk down to gaze from below or enjoy the waters at the bottom of the falls that create a Jacuzzi effect on the shoulders in the shallow pool it arrives at. Many of our guests ask about wildlife, particularly bear. Though I have sighted bear, it is usually from the car in the distance. The bear of northern Maine want little to do with us. Moose sightings are always a treat, sometimes on hikes and sometimes at the lake though the past few years it seems less. This reminds me that it is not the woods of my ancestor’s time, or even the woods of my childhood, but northern Maine is still alive with much wildlife to enjoy. There are hikes only the locals (and avid hikers who seek out such places) know about. One of them is Mount Chase, a nicely challenging but not overwhelming hike off Mountain Road on Route 11 past Patten, which becomes a scenic highway if you miss the turnoff! If you do not miss the turnoff, Mount Chase offers panoramic views that cannot be beat, as well as an intriguing tiny cabin, once occupied by the family that watched for forest fires there years ago. Another option is Sugarloaf, which I have not done in years because the road is rough, but with the proper vehicles people are still enjoying this great hike. Here you can locate with a little sleuthing a sample of the fossils that led Robert Neubauer to his theory of the Appalachian Mountains continuing all the way into Europe and Morroco. Find more info at www.internationalatmaine.org. There is also an easier route that you can access with a hike in just past Shin Pond, which I look forward to exploring this summer. Many of the “local” hikes are not well marked, (making them an adventure) which brings me to the most recent development, sure to help this area, which no longer thrives on potato and dairy farming or logging. Last year 87,563 acres, known as the Katahdin Woods and Waters National Monument (KWW), became the 413th National Park Services Unit. Adjacent to Baxter, there are views of Mount Katahdin, waterfalls and campsites that feed the soul of those craving nature. I have taken the two mile hike up Barnard Mountain, found just before mile 12 on the Katahdin Loop Road. This can be accessed from the Swift Brook Road off Route 11 south from Sherman (exit 264, I-95). This trail offers a fantastic view of Mount Katahdin and Katahdin Lake. From the Monument’s far north entrance, which can be found by taking the second left after you cross over the East Branch of the Penobscot River in Matagamon, just before the north entrance of Baxter, I have experienced a ten mile walk that is a great bike path as well and offers waterfalls at Haskell and Grand Pitch that exemplify the spectacular nature of this wilderness area (park in the designated parking area 4.5 miles in just before Haskell Gate). This year on September 16th, KWW will once again offer the annual opportunity to sleep under the stars which will be spectacular since that area is one of the best for clear dark skies and star gazing. On hand are telescopes and astronomers to point out the planets, Saturn being very evident that night! Though highway signage for finding KWW is limited, it is well marked once you get there. Maps and Directions as well as other info on the New National Monument can be found at: https://www.nps.gov/kaww. Last but not least, you can kayak, boat or ATV (which disturbs the quiet but is a way many modern outdoor enthusiasts go) to Bible Point, a State designated site where Theodore Roosevelt went to read his Bible, contemplating the wonders of nature and life. The opportunities to be in nature in this region abound, whether kayaking on the lakes or walking the ATV trails, where you rarely meet a soul because of the low population and vast expanse of lands, rolling hills and open fields. Wildflowers are nature’s way of offering the opposite of groomed gardens, offering delight and curiosity along your walks through the woods and around the lakes. With very little effort, northern Maine offers a paradise you can step into easily by driving up 95. The sun warms you during the day, the moon lights your way at night. As a young Theodore Roosevelt did with my great grandfather, you too, with a little effort, can take the time to step away into the healing nature of northern Maine. All it takes is a little time, planning…and maybe asking a local how to get to Mount Chase! *Please note a lot of roads in Northern Maine are shared private logging roads. Visit: www.nps.gov for information and warnings. Donna Sewall Davidge purchased her great grandfathers’ homestead in 1997, making the unlikely choice to turn it into a small personalized Yoga retreat, which is a unique offering and has been featured in many magazines and chosen top ten worldwide online by Gayot (2009-2010). She operates the retreat from May to October and has been teaching yoga and meditation since 1985 in the winter months in New York City. Like her ancestors, she loves the natural beauty of northern Maine and the healing ability of its air, waters and forests. For more information, contact Donna at: 646-316-5151 or visit: www.sewallhouse.com or www.donnadavidgeyoga.com.